I go through a similar crisis several times and lost lots of precious files including photos, documents, movies, and others. If this’s the situation of a home user, how it will affect companies and business firms? The consequences will be severe than you expected. Take a regular backup of your systems to avoid accidental loss of data, money, and faith of customers. In a recent post, we have explained the latest security threats a common internet user faces and how to safeguard your computer from such malicious attacks. If you are new to this blog, make sure to read 12 Security Tips to Protect Your Computer from Ransomware Attacks. In this article, we’ll show you 6 best online backup services to securely store data in the cloud and restore them when needed. Backblaze is the most recommended software for cloud backup. It will backup any type of file without any restrictions to file size and numbers. All your data is stored in secure data centers with end-to-end encryption and biometric security. Your files cannot be opened without a second level password which will be sent to your phone. So no one else can access them without your permission. Either you can set an automatic backup or schedule it according to your convenience. Backblaze allows you to monitor the backup status, access the files from any device and restore whenever you need. The pricing starts at $6 per month per computer for personal plans. Business plans start at $50 per year per computer for unlimited cloud backup. CrashPlan is one of the best cloud backup services to protect your precious data. It lets you backup files to local drives and computers, network and external drives and online to CrashPlan Central. CrashPlan store files in advanced security environments with end-to-end encryption and industry best security measures. It automatically backs up the system at 3 am by default to avoid interfering with you while you’re using your computer. Backup set is another feature of the app. It allows you to specify which files should be backed up first. Thus you can make sure that the crucial files are backed up regularly and without any mistake. CrashPlan works silently in the background with minimum CPU power, compress backup files to keep it as small as possible and protect your data in real time. It has dedicated mobile apps to allow you to access files from virtually anywhere, anytime. Carbonite is one of the popular online backup services to safeguard your files against accidental deletions, hardware failures, and malicious attacks. It will automatically backup your data and restore them instantly in a few mouse clicks. Carbonite enables military-grade encryption for your files to protect them from prying eyes. You can access backed up files anytime from the computer, smartphone, and tablet. SOS Online Backup is a renowned name in backup services. It lets you backup PCs, Macs, and unlimited mobiles to cloud vault at regular intervals. It will automatically scan for important file types including images, music, video, documents and add them to your backup queue. SOS provides triple-layer 256-bit encryption to your files with an optional private encryption key to prevent unauthorized usage. You’re able to access, share data from any device through dedicated apps. The pricing starts at $4.99 per month for up to 5 PCs, Macs and unlimited mobiles. SugarSync is a fast and reliable cloud backup service to share, sync and backup files with instant file sync technology. It backs up data in real time and lets you access the latest file versions in the same location from any device you have. It is simple and easy to use. Just right-click on a folder to add it to SugarSync. The app will continuously back up the folder from the background and make it instantly available across the devices. The pricing starts at $7.49 per month per user for 100 GB storage. 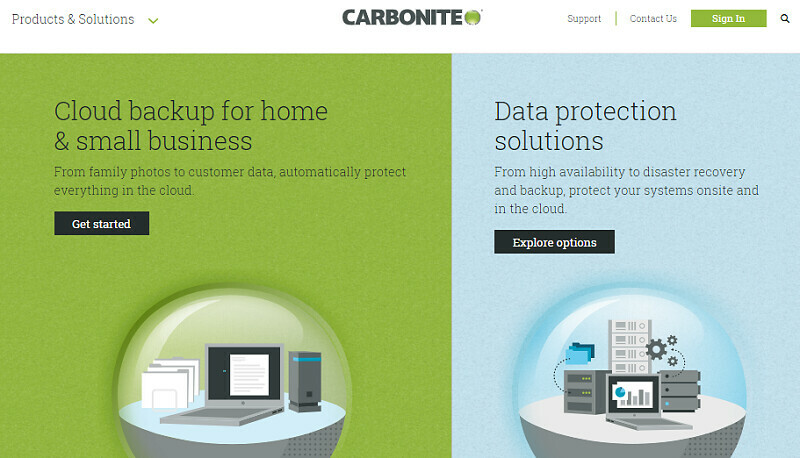 Mozy is another online backup service from Carbonite. It will automatically back up your files and store them with top-class security standards. During the backup, it will encrypt your files first then sent over a secure SSL connection and stored with endpoint protection. Mozy adopts advanced security measures to safeguard your files and business in the data center. So you needn’t worry about the file security. The files can be accessed from anywhere on the go through Mozy’s mobile apps for Android and iOS devices. Save your important files to Mozy Sync folder to automatically sync them across computers, smartphones, and tablets. When talking about restoring, you can make use of Mozy restore manager for easily transferring files to your computer or do it yourself in one click. Are you using any cloud backup services to safeguard your business and data?